Villa UJV 320, also knonw as Habitation Saint Louis, is a 4 bedroom villa located on the hillside above the charming village of Corossol, St Barts. Private and quiet, this villa offers sea views of Corossol and the Gustavia Harbour entrance. This villa is built on 2 levels and offers a private, direct footpath access to Corossol beach. On the main level, there are 2 bedrooms with ensuite bathrooms and private terraces with ocean view. On opposite sides of the living room/kitchen area, the outdoor covered space offers dining and sitting areas. On the lower level, the 3rd & 4th bedrooms, with ensuite bathrooms, are just in front of the pool. The large deck & terrace overlook Corossol Bay, perfect for enjoying sunsets and admiring sailing boats and yachts entering the harbor. This inviting villa is perfect for family or a group of friends. 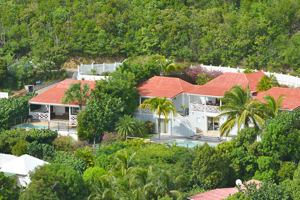 Villa UJV 320 can be rented with next-door villa UJV 320 PSL, Petit Saint Louis, for a total of 5 bedrooms. UJV 320 and UJV 320 PSL are rented together during the Christmas/New Year period.